The Stockholm International Peace Research Institute (SIPRI) estimated military expenditures as of 2012[update] at roughly $1.8 trillion. This represented a relative decline from 1990, when military expenditures made up 4% of world GDP. Part of the money goes to the procurement of military hardware and services from the military industry. The combined arms-sales of the top 100 largest arms-producing companies amounted to an estimated $395 billion in 2012 according to SIPRI. In 2004 over $30 billion were spent in the international arms-trade (a figure that excludes domestic sales of arms). According to SIPRI, the volume of international transfers of major weapons in 2010–14 was 16 per cent higher than in 2005–2009. The five biggest exporters in 2010–2014 were the United States, Russia, China, Germany and France, and the five biggest importers were India, Saudi Arabia, China, the United Arab Emirates and Pakistan. Many industrialized countries have a domestic arms-industry to supply their own military forces. Some countries also have a substantial legal or illegal domestic trade in weapons for use by their own citizens, primarily for self-defence, hunting or sporting purposes. Illegal trade in small arms occurs in many countries and regions affected by political instability. The Small Arms Survey estimates that 875 million small arms circulate worldwide, produced by more than 1,000 companies from nearly 100 countries. Governments award contracts to supply their country's military; such arms contracts can become of substantial political importance. 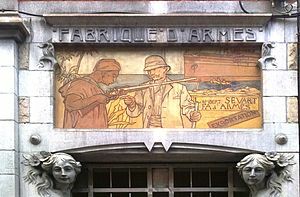 The link between politics and the arms trade can result in the development of what U.S. President Dwight D. Eisenhower described in 1961 as a military-industrial complex, where the armed forces, commerce, and politics become closely linked, similarly to the European multilateral defence procurement. Various corporations, some publicly held, others private, bid for these contracts, which are often worth many billions of dollars. Sometimes, as with the contract for the international Joint Strike Fighter, a competitive tendering process takes place, with the decision made on the merits of the designs submitted by the companies involved. Other times, no bidding or competition takes place. Encompassing military aircraft (both land-based and naval aviation), conventional missiles, and military satellites, this is the most technologically advanced sector of the market. It is also the least competitive from an economic standpoint, with a handful of companies dominating the entire market. The top clients and major producers are virtually all located in the western world and Russia, with the United States easily in first place. Prominent aerospace firms include Rolls Royce, BAE, Dassault Aviation, Sukhoi, Mikoyan, EADS, Leonardo, Thales Group, Lockheed Martin, Northrop Grumman and Boeing. There are also several multinational consortia mostly involved in the manufacturing of fighter jets, such as the Eurofighter. 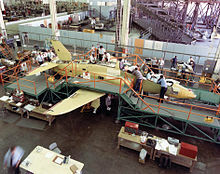 The largest military contract in history, signed in October 2001, involved the development of the Joint Strike Fighter. The cybersecurity industry is becoming the most important defence industry as cyber attacks are being deemed as one of the greatest risk to defence in the next ten years as cited by the NATO review in 2013. Therefore, high levels of investment has been placed in the cybersecurity industry to produce new software to protect the ever-growing transition to digitally run hardware. For the military industry it is vital that protections are used for systems used for reconnaissance, surveillance and intelligence gathering. However, to protect the cyber world from attacks there are advanced cyber protection strategies used such as content, cloud and wireless security. These can be intertwined to form several secure layers. Nevertheless, cyber attacks and cyber attackers have become more advanced in their field using techniques such as Dynamic Trojan Horse Network (DTHN) Internet Worm, Zero-Day Attack, and Stealth Bot. As a result, the cybersecurity industry has had to improve the defence technologies to remove any vulnerability to cyber attacks using systems such as the Security of Information (SIM), Next-Generation Firewalls (NGFWs) and DDoS techniques. According to research institute, SIPRI, the volume of international transfers of major weapons in 2010–14 was 16 per cent higher than in 2005–2009. The five biggest exporters in 2010–14 were the United States, the United Kingdom, Russia, China and France, and the five biggest importers were India, Saudi Arabia, China, the United Arab Emirates (UAE) and Pakistan. 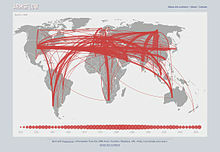 The flow of arms to Africa, the Americas, Asia and Oceania, and the Middle East increased significantly between 2005–2009 and 2010–14, while there was a notable decrease in the flow to Europe. SIPRI has identified 60 countries as exporters of major weapons in 2010–14. The top 5 exporters during the period were responsible for almost 74 per cent of all arms exports. The composition of the five largest exporters of arms changed between 2005–2009 and 2010–14: while the United States and Russia remained by far the largest exporters, China narrowly, but notably, replaced Germany as the third largest exporter as Germany slid down to 6th place. The top 5 exported 14 per cent more arms in 2010–14 than the top 5 in 2005–2009. Units are in Trend Indicator Values expressed as millions of U.S. dollars at 1990s prices. These numbers may not represent real financial flows as prices for the underlying arms can be as low as zero in the case of military aid. The following are estimates from Stockholm International Peace Research Institute. Note that rankings for exporters below a billion dollars are less meaningful, as they can be swayed by single contracts. A much more accurate picture of export volume, free from yearly fluctuations, is presented by 5-year moving averages. Next to SIPRI there are several other sources that provide data on international transfers of arms. These include national reports by national governments about arms exports, the UN register on conventional arms and an annual publication by the U.S. Congressional Research Service that includes data on arms exports to developing countries as compiled by U.S. intelligence agencies. A list of such sources can be found at the SIPRI website. Due to the different methodologies and definitions used different sources often provide significantly different data. SIPRI uses the "trend-indicator values" (TIV). These are based on the known unit production costs of weapons and represent the transfer of military resources rather than the financial value of the transfer. Units are in Trend Indicator Values expressed as millions of U.S. dollars at 1990s prices. These numbers may not represent real financial flows as prices for the underlying arms can be as low as zero in the case of military aid. Please note that arms import rankings fluctuate heavily as countries enter and exit wars. Export data tend to be less volatile as exporters tend to be more technologically advanced and have stable production flows. 5-year moving averages present a much more accurate picture of import volume, free from yearly fluctuations. This is a list of the world's largest arms manufacturers and other military service companies who profit the most from the War economy, their origin is shown as well. The information is based on a list published by the Stockholm International Peace Research Institute for 2015. The list provided by the SIPRI excludes companies based in China. ^ SIPRI Yearbook 2013. www.sipri.org. Retrieved on 2016-04-29. ^ Stockholm International Peace Research Institute. Sipri.org. Retrieved on 2012-05-09. ^ Arms trade key statistics. BBC News (2005-09-15). Retrieved on 2012-05-09. ^ a b c d "Trends in International Arms Transfer, 2014". www.sipri.org. Stockholm International Peace Research Institute. Retrieved 18 March 2015. 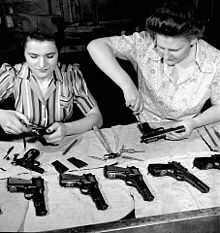 ^ "Small Arms Survey — Weapons and Markets- 875m small arms worldwide, value of authorized trade is more than $8.5b". 8 December 2014. Retrieved 26 March 2015. ^ "William George Armstrong (1810–1900)". ^ Dougan, David (1970). The Great Gun-Maker: The Story of Lord Armstrong. Sandhill Press Ltd. ISBN 0-946098-23-9. 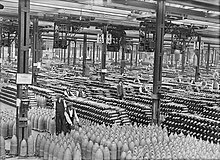 ^ "Defense Industries - Military History - Oxford Bibliographies - obo". www.oxfordbibliographies.com. Retrieved 2015-11-03. ^ Stohl, Rachel; Grillot, Suzette (2013). The International Arms Trade. Wiley Press. Retrieved 2013-02-07. ^ Debbie Hillier; Brian Wood (2003). "Shattered Lives – the case for tough international arms control" (PDF). Control Arms Campaign. p. 19. Archived from the original (PDF) on 2011-07-23. Retrieved 2009-03-28. ^ "Cyber security for the defence industry | Cyber Security Review". www.cybersecurity-review.com. Retrieved 2015-11-02. ^ a b Top List TIV Tables-SIPRI. Armstrade.sipri.org. Retrieved on 2012-05-09. ^ armstrad — www.sipri.org Archived May 20, 2005, at the Wayback Machine. Sipri.org. Retrieved on 2012-05-09. ^ "EUROPE ONLINE". europeonline-magazine.eu. Retrieved 30 November 2015. ^ "SIPRI Releases Top 100 Defense Company Data". Defense News. Retrieved 26 March 2015. ^ "The SIPRI Top 100 Arms-Producing and Military Services Companies, 2015" (PDF). ^ Barry Kolodkin. "What Is Arms Control?" (Article). About.com, US Foreign Policy. The New York Times Company. Retrieved 13 May 2012.